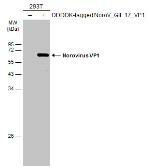 Specificity/Sensitivity : Recognizes the capsid protein of Norovirus (native and recombinant). Does not cross react with Rotavirus,Adenovirus or Astrovirus. 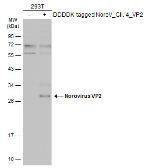 Specificity/Sensitivity : Recognizes the capsid protein of Norovirus (native and recombinant). Does not cross-react with Rotavirus,Adenovirus or Astrovirus. 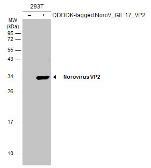 Specificity/Sensitivity : Specific for the genogroup I capsid protein (native & recombinant). Does not crossreact with genogroup II. Specificity/Sensitivity : Specific for the capsid protein (native & recombinant). 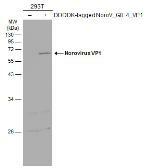 Does not crossreact with: Rotavirus, Adenovirus or Astrovirus.